Carbon pricing is spreading rapidly around the world [i]. However prices almost everywhere are far too low at the moment to price emissions efficiently. 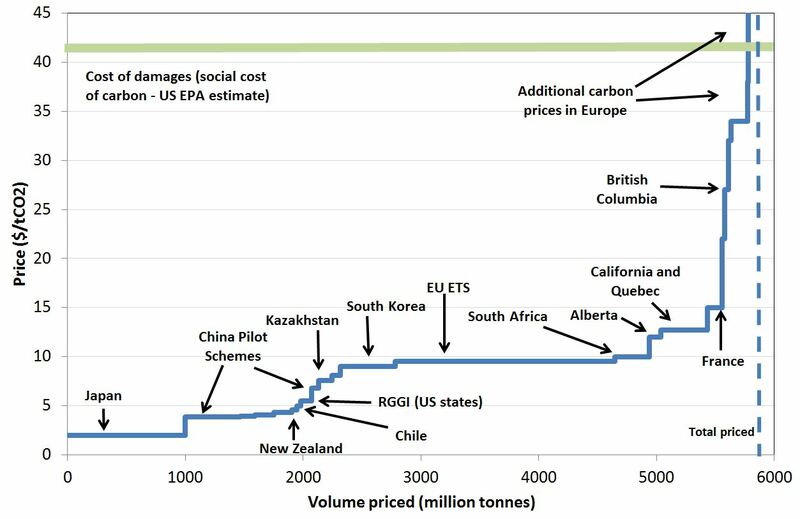 The chart below summarises carbon prices in those jurisdictions with pricing. The horizontal axis shows volumes, the vertical axis shows prices, as in a conventional commodity supply curve. The vast majority of priced emissions – about 90% of the total – are priced below $14/tCO2. Higher carbon prices are invariably for small volumes, and are found only in Europe and British Columbia. 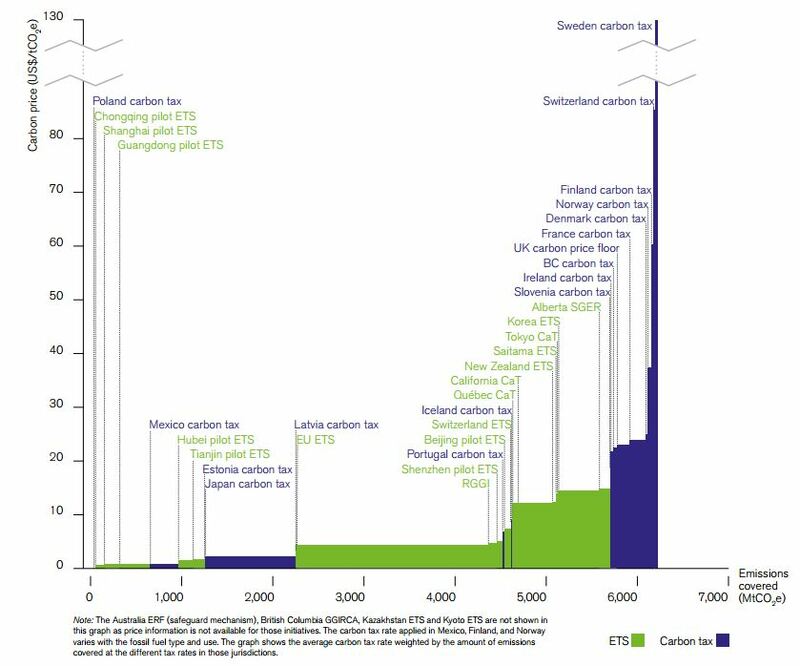 They include prices under the French carbon tax, which covers sectors outside the EUETS, the UK carbon price floor, where the EUA price is topped up, and longstanding carbon taxes in Scandinavia. The chart also shows the social cost of carbon – which represents the cost of the environmental damage caused by emissions – as estimated the US EPA. This is almost certainly an underestimate[ii] of the true cost, and the concept has other limitations that imply it is no more than a lower bound to what it is worth paying to avoid emissions. Carbon prices are thus too low even compared with a likely underestimate of the cost of emissions. Taxes are too low and caps are too loose to price carbon adequately. Consequently efficient abatement is not happening[iii]. Price data is from May 2015. I have excluded the Mexican carbon tax on the grounds that it does not apply to natural gas and so does not fully tax carbon. The Chilean carbon tax is included although it does not come into force until 2018. The South African carbon tax is scheduled to be introduced next year, but may be postponed, or may not be introduced at all. The EUETS price would be somewhat higher but for the weakness of the Euro against the dollar at the moment. The Social Cost of Carbon is the US EPA estimate at a 3% discount rate and converted to $2015 – see reference 2. Prices may increase in future. However this process looks likely to be too slow in most cases. 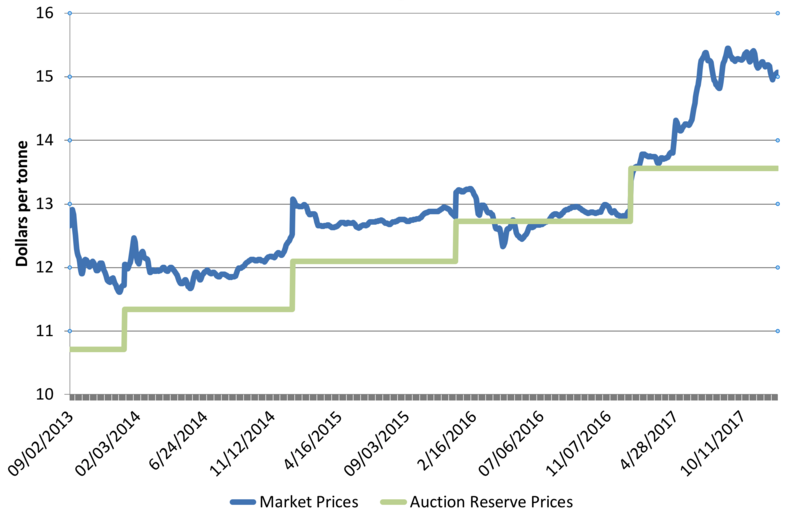 For example, under the California and Quebec scheme prices are currently at the floor set by the auction reserve. This escalates at 5% p.a. real terms. However at the present rate this will take until around 2050 to catch up even with the EPA’s estimate of the social cost of carbon[iv], which also shows increases in real terms over time. Prices elsewhere in North America are mostly lower still. 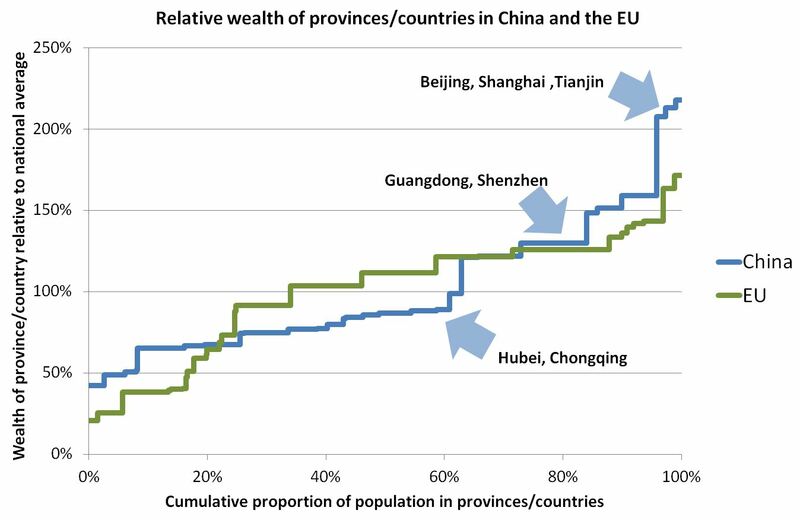 In the EU there is little evidence from forward markets that allowances will reach significantly closer to the social cost of carbon over the next few years, and it seems unlikely that China will seek to price emissions at much above levels that prevail in the EU and North America. It therefore seems likely on present trends to be a long time before prices in major jurisdictions reach levels that reflect the cost of damage from climate change, or are sufficient to limit temperature rises to two degrees. This implies that further action is needed to make higher prices more politically acceptable. Doing this will be a huge challenge, but two strands of any solution appear clear. Ensuring that industry that is genuinely vulnerable to carbon leakage is appropriately safeguarded from competitive distortions will help mitigate political obstacles to higher pricing. And efficient carbon pricing may further be helped by more explicit recycling of revenue to citizens, including ideas such as cap-and-dividend, in which the proceeds of sale of allowances under a cap-and-trade scheme are returned directly to citizens. This in effect defines citizens as owners of the right to emit and so gives everyone a stake in higher prices (more on this in a future post). Elements of such an approach are evident in British Columbia and were part of the former Australian scheme. Measures other than carbon pricing are in any case necessary to bring about the required transformation of the energy sector[v]. And while carbon prices remain too low there will be an even greater need for such approaches, even if these may sometimes themselves help keep the carbon price low. Funds to subsidise deployment of low carbon technologies may come from the proceeds of carbon pricing, especially in jurisdictions such as North America where earmarking of revenues is common. The spread of carbon pricing is a success story, but a limited one in view of the prices prevailing to date. Efforts both to strengthen the carbon price and enhance complementary policy approaches are needed if climate change is to be limited to acceptable levels. [iii] The marginal price signal is at too low a level, so some economically efficient abatement is not being signalled. It is possible that an inefficient mix of abatement is being purchased, even though the level of abatement is efficient. This could be the case if, for example, there was too much expensive abatement through renewables programmes. However for a number of reasons this does not seem plausible. For example, abatement is currently insufficient to meet the agreed 2 degree target, and support for renewables globally is clearly not excessive in view of their present share of generation and the required speed of reduction (although it may well be desirable for more of the support to be in the form of a higher carbon price on fossil fuel use). [iv] Escalating the current carbon price at 5% real terms to 2050 gives a price of about $74/tCO2, roughly in line with the EPA’s central estimate of the Social Cost of Carbon at that date of 2011$76/tCO2. This entry was posted in carbon pricing, Climate change policy, emissions trading, international comparisons and tagged carbon pricing, carbon taxes, climate change policy, emissions trading, emissions trading scheme, social cost of carbon on 02/06/2015 by adamwhitmore. Carbon pricing continues to spread around the world, with major schemes in Chinese provinces now in place. 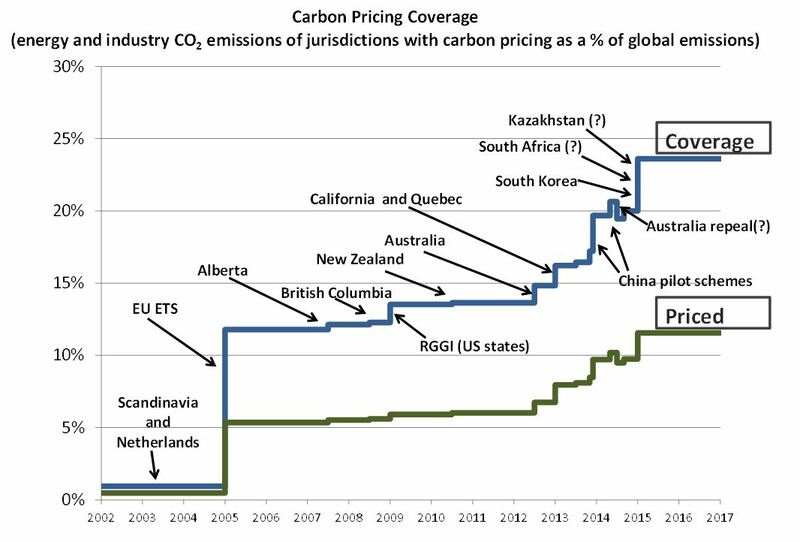 For my first post this year it seems timely to review progress on implementing carbon pricing around the world. As I’ve previously noted, the spread of carbon pricing during the past decade has been remarkable. Once confined to a few small economies in northern Europe, it has become a worldwide phenomenon, with more than a dozen major carbon pricing schemes either in place or under development around the world. The major step forward in last year has been the start of five regional pricing schemes in China, although trading in these markets remains relatively illiquid. The expansion of carbon pricing in China is set to continue this year as two more trial schemes go live. A year from now, assuming current programmes run to schedule, carbon pricing will be in place in jurisdictions that together account for between a fifth and a quarter of total global CO2 emissions from energy and industrial processes. Not all emissions in these jurisdictions are priced, as governments use other policy instruments to reduce emissions in particular sectors, for example surface transport in the EU. Nevertheless, by next year over 10% of the world’s energy and industry CO2 emissions are likely to be priced. On the Chart below the top (blue) line shows how the percentage of emissions in jurisdictions with pricing has grown over the last decade. The total includes all energy and industry CO2 emissions taking place in each jurisdiction with carbon pricing. Thus, if all jurisdictions in the world had carbon pricing in place the total coverage would be shown as 100%. The lower (green) line shows the percentage of energy and CO2 emissions that are actually priced. For example, the EU accounts for around 11% of emissions, but only a little under half of these are priced by the EUETS. The gap between the blue and the green lines is the proportion of emissions covered by other policies, or by no policy. Even if carbon pricing were to be extended to 100% of jurisdictions it is likely that some emissions would remain unpriced. CO2 emissions from land use and emissions of other greenhouse gases are excluded from the calculations. Including these would reduce the proportion of emissions in jurisdictions with pricing, in part because of a large volume of emissions from deforestation in countries without national carbon pricing, notably in Brazil and Indonesia. 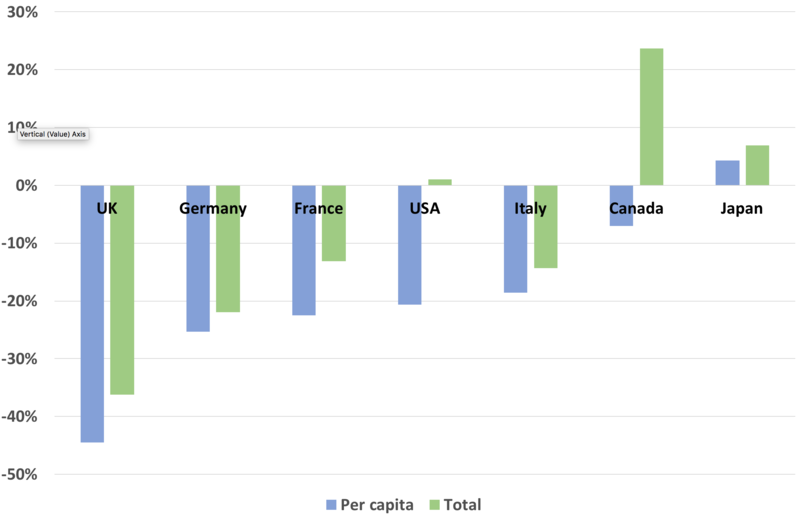 Nevertheless the trend is remarkable, and implies that any country considering carbon pricing is very much part of the worldwide policy mainstream. By far the most significant new development over the next few years is likely to be the extension of carbon pricing across all of China, which the Government has indicated it wishes to see in the next few years. This alone would raise global coverage of carbon pricing to over 40%. Indonesia is also looking at carbon pricing with a prospective voluntary market potentially leading to a compulsory market in due course. We may also see somewhat more widespread carbon pricing in the USA. EPA regulation of existing power plants under the Clean Air Act will oblige states to put in place implementation plans. This may lead states to establish emissions trading schemes, or (more likely) join the Regional Greenhouse Gas Initiative (RGGI), which covers the power sector only. Indeed some states are understood to have already expressed an interest in doing so, although it is not yet clear in which states interest is strongest. Expansion of Western Climate Initiative trading schemes beyond California and Quebec also remains possible. There also appears to be a trend towards carbon pricing in Latin America. 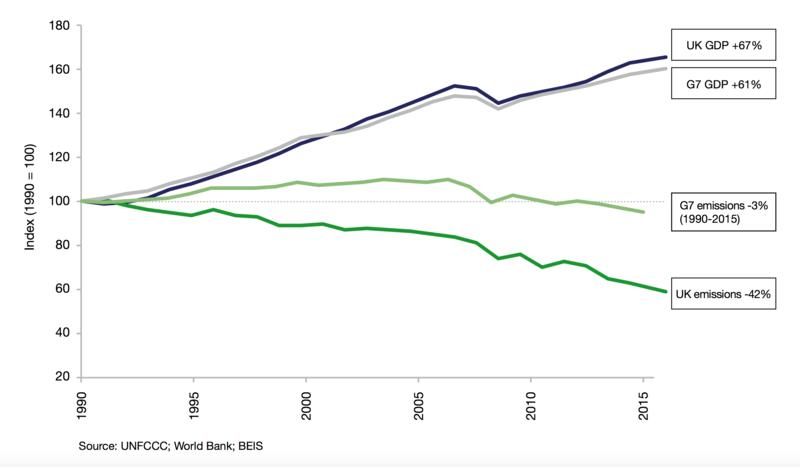 Mexico may strengthen its currently very limited carbon tax (excluded from the chart) over time. Provinces in Brazil have looked at emissions trading schemes, and discussions on an ETS are now underway in Chile. Future trends are, however, far from clear, and the commitment by the Australian government to repeal its carbon pricing legislation is an indication that consistent progress is far from guaranteed. For those involved with carbon pricing day-to-day it is often easy to forget just how recent it is, and just how much progress has been made in a short time. There is still only a single decade of experience, compared with many decades, and in some cases centuries, for other types of regulation. As a regulatory “technology” large scale carbon pricing remains more recent than the ipod, and there is still much to learn and a long way to go. But the achievement to date is both substantial and encouraging. 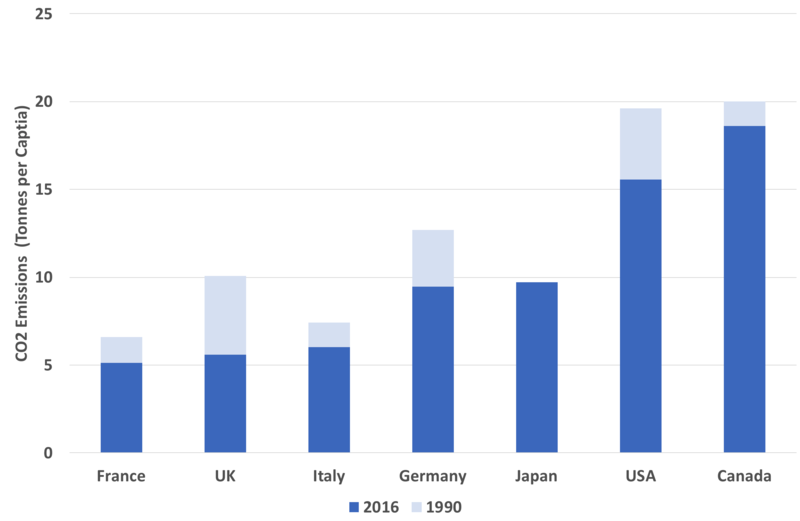 Notes on inclusion and exclusion from the chart: The small carbon tax introduced in Japan in 2012 by modifying energy taxes is excluded, as is the carbon tax in Mexico, which is small and has limited scope. The Tokyo emissions trading scheme is excluded as its current status is unclear. The Swiss scheme is included in the total for the EU. The status of the Kazakhstan scheme is currently uncertain and I have allowed for a year’s delay to 2015. For simplicity the California and Quebec schemes are shown with full coverage from their introduction in 2013, although they do not reach this in practice until next year. Question marks indicate measures which have yet to be enacted. This entry was posted in carbon pricing, Climate change policy, emissions trading, international comparisons and tagged carbon pricing, carbon taxes, climate change, climate change policy, emissions trading on 16/01/2014 by adamwhitmore.